Dr. Ernie Ward contemplates the ever-dangerous conditions of bloat and GDV in large and giant dog breeds. For more from Dr. Ward, find him on Facebook or at www.drernieward.com. 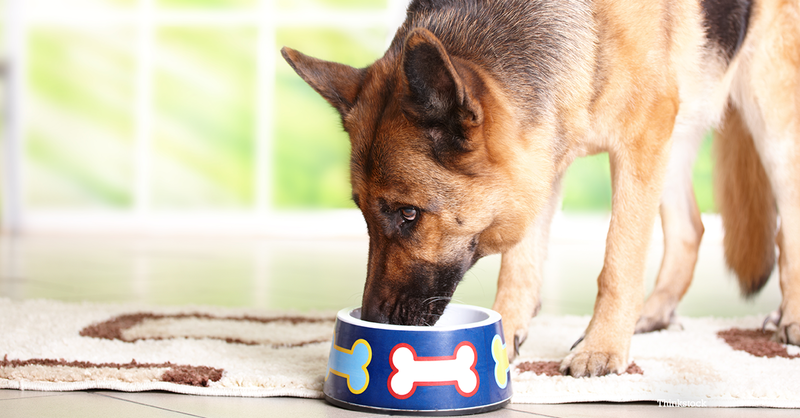 Does food cause bloat in dogs? Do certain ingredients contribute to excessive gas production in the stomach of dogs? Does elevated feeding help? What can be done to prevent this oftentimes deadly medical condition? Many people speculate that what we feed our dogs plays a role in bloat or gastric dilatation-volvulus (GDV). What does the scientific literature say? Turns out there’s been quite a bit of research in this area over the past forty years. It also turns out that food appears to have less impact on the development of bloat and GDV than you might’ve guessed. We’ve also got a lot to learn. Bloat and GDV is one of the most frightening conditions a pet parent or veterinarian will ever encounter. Your dog goes from being happy and healthy one moment to writhing in agony on its side as its belly swells the next. Even if the pet is rushed to the veterinarian immediately, death occurs in 10-16% of all cases. Much higher rates are estimated in dogs not receiving immediate medical intervention. 22% to 24% of giant and large-breed dogs will develop bloat or GDV during their lifetime. 42% of all Great Danes will likely experience GDV. This is a serious problem. Let’s start with the hypothesis that dry food causes bloat. Some have postulated that dry food contributes to proliferation of the bacterium C. perfringens that could be responsible for stomach gas formation. Scientists have sampled the gas from bloat victims and found it to be mainly air, not a fermentation gas of bacteria. Others suggest that dry food slows stomach emptying, increasing the odds of bloat and stomach torsion. A study comparing canned meat-based and dry cereal diets found no significant difference in the amount of time it took food to exit the stomach. According to current research, feeding a dog dry food doesn’t seem to increase or decrease the likelihood of GDV. In fact, moistening dry food appears to have no benefit in reducing the risk of GDV. A food with fat or oil (vegetable or animal) listed in the first four ingredients does seem to increase the risk of GDV. The authors of that study propose that high-fat diets slow stomach-emptying times compared to high-protein or high-carbohydrate diets. Many of my clients say they’ve been advised to add oil or water to dry kibble to reduce the risk of GDV. According to the research, this is not advisable. What about raising the food bowls? The theory is elevated feedings help reduce the amount of air that is swallowed. Nope. A five-year study found raising the bowls actually increased the incidence of GDV. Even exercise before or after eating had no effect in that same study. What does seem to help is feeding your dog more than once daily. Two to four times is ideal. Slowing down the rate at which your dog eats using food puzzles also may help. Avoid high fat diets or those with added oils high on the ingredient list. If your dog is at risk, consider having preventive surgical gastropexy performed. Age, breed, family history, fear or stress, food gulpering, and once daily feedings all seem to be more important factors than food in the development of bloat and GDV. If you have a large- or giant-breed dog, talk to your veterinarian about how to reduce the chances your dog will develop this terrifying situation. Now go get a food puzzle and use it two or more times a day.